Scholars believe that goblins may once have been a class of aberrants, but have since become more common and are now counted as an actual, interbreeding lesser race. Though their population is small (estimated at less than 50,000), goblins are becoming more powerful and have had a significant influence on some historical events. Physically, goblins appear as small and ugly, green skinned humanoids. They stand about 1.25 meters tall (4 ft) and have slight builds. Their black hair is oily and tangled. Their faces are hideous, cruel visages with jutting chins, high cheek bones, long noses and small pointed teeth. Their coal black eyes lack pupils. Though small and weak, goblins are quick and skilled with weapons. Goblins are wicked creatures of the dark with hearts as black as midnight. 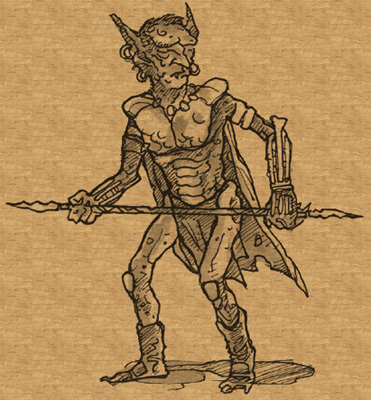 Goblins usually dwell in tribes up to 100 strong which is led by a strong warchief or skilled shaman. Goblins often ally with other evil races (orcs, ogres and saurians primarily). Occasionally, multiple goblin tribes will unite, but such alliances rarely endure. Goblins can be found in large numbers in the Coalition and in Duthelm. Independent tribes of goblins are also scattered about the mountainous regions of Ithria. Goblin tribes and orc tribes often fight for the same territory. Within Coalition territory, on the east shore just south of the Barakose Swamp, there is a huge concentration of goblins that have formed a rudimentary civilization. Here, thousands of goblins dwell in a large gathering of semi-permanent structures and caves. This place is called the Goblin Kingdom. Ruling over this tiny kingdom is an abnormally large and strong specimen who claims the title "The Goblin King" and rules from a ruined keep. The Goblin King and his minions are allied with the forces of the Coalition, but do not hold a seat on the Council of Seven. Goblins are cowardly, but cunning and cruel. Despite their small stature and cowardice, goblins are dangerous foes. They are skilled at concocting poisons and have been known to dabble in alchemy. They delight in using barbed arrows, serrated blades and other wicked weapons. 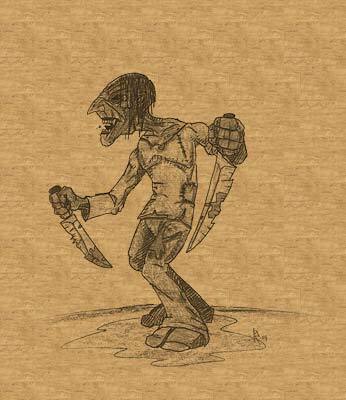 Lone goblins will usually run from a threat, but more often than not, goblins will hunt and fight in groups. Typically, they attack from behind or from a distance. They have no sense of honor and will gladly take advantage of an opponent's weakness. Goblins have a natural affinity for magic and typically one in ten will have mastered spellcraft. Hence, a typical goblin tribe may have as many as four or five shamans (or more). These goblin shamans learn a variety of spells which usually involve divination, darkness, poisoning, pain and death. As with all races, they are exceptions... while most goblins are cruel and selfish, there are a rare few who turn their back on goblin society. They sometimes choose to live among the other races. Often these individuals are loners and face prejudice from the other races, particularly the elves who greatly dislike goblins and their kin. It is rare to find a goblin living and working in the civilized kingdoms, but not unheard of. Occasionally a goblin will be hired on with half-orcs and such as caravan guards, mariners or the like. In the more uncivilized areas, such as the Coalition, Ormek and Duthelm, goblins are much more common and can be found living and working among all the races found there. Many chapters of Normidian history books describe the famous goblin Agurad the Toothless who united the goblin tribes and orcish clans in the Dragon Maw mountains in 844 CY and nearly wiped out Normidia. The scrolls of history also record the deeds of Sulgis the Goblin who joined a mercenary group called the Seven Hands and, in the spring of 1192 CY, helped rescue an Arkalian Duke and four knights who had been captured by a goblin tribe in the Trackless Mire. For daring deeds and exceptional bravery, Sulgis received honorary knighthood from the Duke and went on to have an illustrious career with the Seven Hands until his death in 1218 CY. He was buried with honor in the town cemetery in the town of Edgewood.